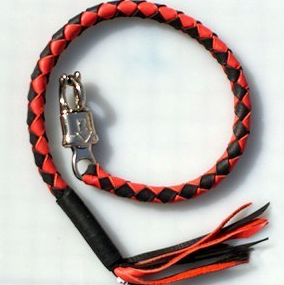 As discussed yesterday, the courts have upheld the constitutionality of California Penal Code section 12020(a) — the law with which bikers are being charged for carrying decorative leashes, aka “getback whips” on their motorcycles. It would appear that this definition could reasonably be applied to the decorative leashes at issue here. Specifically, the leashes are a small mass of metal (the metal clip) on a flexible handle or strap (the leather strap). However, Fannin provides language that may be crucial in defending a charge of PC 12020(a) for possession of a decorative motorcycle leash. The Fannin Court examined several cases wherein the defendants were charged with carrying objects that were obviously designed to be used as weapons, such as “56 one-inch metal washers, strung on rawhide . . . , knotted to hold the washers together and form a seven-and-a-half-inch handle that could be looped around the wrist.” In those circumstances, mere possession was enough to support a conviction under the statute. However, the Court acknowledged that many legal, everyday items, such as a bicycle lock or table leg, could fall within the scope of the statute. As such, the government may look to suspicious circumstances to prove that such an item was intended to be used as a weapon. Tomorrow: Tips from the motorcycle accident lawyers at Riderz Law on defending a charge of Penal Code section 12020(a), and a tip that may help to avoid police harassment altogether.